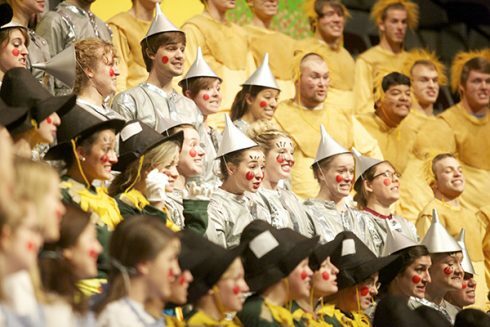 The senior class brought The Wizard of Oz to life in 2013. If Sing Song focused on creativity-in-song in the 1980s, then one could say the curtain dropped for creativity-on-stage as the show rolled into the 1990s and 2000s. The senior class in 2013 performs as the Scarecrow, Tin Man and Cowardly Lion. The curtain literally started dropping on Sing Song acts in the late ’80s. In 1987, students voted to purchase a curtain for the Sing Song stage in Moody Coliseum, allowing each act to be opened and closed with the fabric’s rise and fall. “The curtain makes a world of difference for acts on stage,” said Dodd Roberts (’86), four-year co-director for his class. Prior to adding the curtain, groups entered and exited the stage in the dark. Most people didn’t notice because their eyes were focused on the host and hostess performing on the lower stage, but without a curtain, elaborate props and sets were more difficult to manuever seamlessly. Sigma Theta Chi member and 2007 co-chair Caddie Coupe (’07) said one of her best memories involved setting her club’s act on stage behind the curtain her junior year. Club members used the stairs on one side of the stage and constructed a slide covering the steps. During the act, penguins slid from the top of the stage to the bottom. 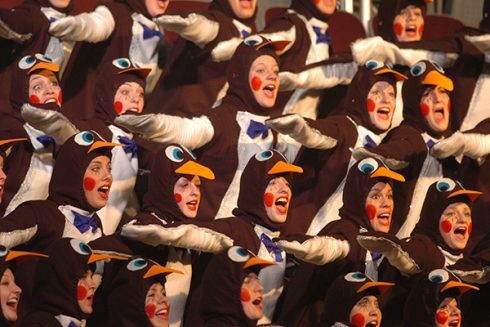 Penguins from Sigma Theta Chi slid down the Sing Song stage in 2006. “The crowd loved it!” Coupe said. “You could hear the ‘ooh’s and ‘ahh’s as Siggies went down the slide.” She explained the concept was designed to replicate penguins sliding in the snow in Antarctica. Those creative exercises continued and peaked with another group: the Class of 2013. Nick Tatum (’13) directed the ensemble for four years, and they won each time, achieving the ever-elusive clean sweep victory for classes. Tatum directed his class as the British Royal Guard his freshman year, cupids his sophomore year, Moses and the children of Israel his junior year and The Wizard of Oz his senior year. “We actually studied videos of old acts to see what worked,” Tatum said. 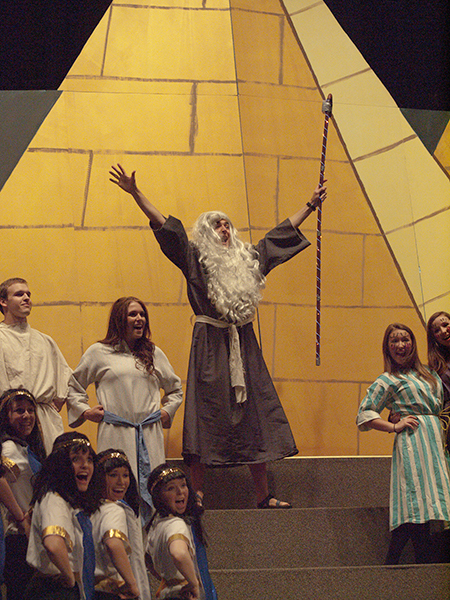 Moses and the Israelites starred in the 2012 performance of the junior class. 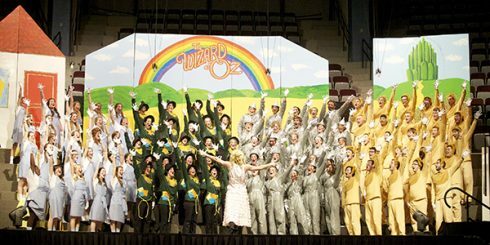 The seniors’ Oz act was a triumph for the four-year winning streak and set a new standard for creativity. The act mimicked the iconic 1939 movie of the same name, starting in simple shades of black and white. 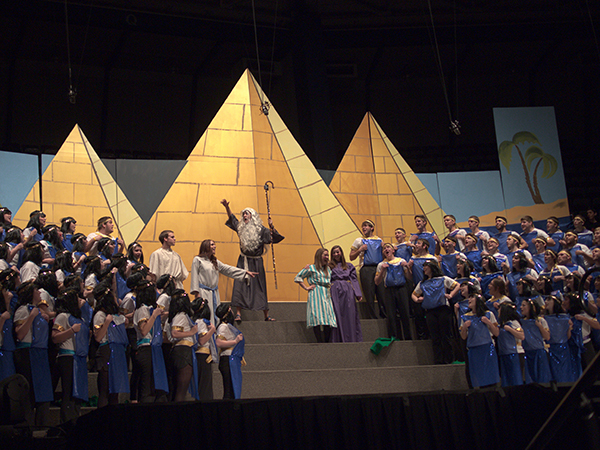 A two-dimensional house was set at the front of the stage with the singers behind it, and seconds later, a tornado blew the house away, revealing the full group. 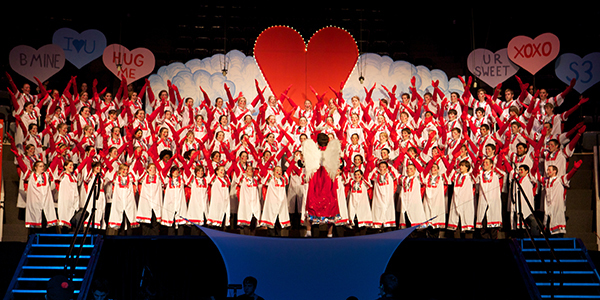 As the song continued, black-and-white costumes were discarded to turn singers into full-color munchkins. Then, munchkin costumes were discarded to reveal four colorful sections representing Dorothy, the Scarecrow, the Tin Man and the Cowardly Lion. The crowd roared at the sight. The act concluded with Tatum changing costumes himself, turning from the Wicked Witch of the West to Glinda, the Good Witch of the North. Today, elaborate backdrops and props continue to push beyond traditional limits of creativity. Groups don’t just focus on costumes, but on costume changes in mid-act. Songs continue to be creative, but song selection is now strategic, as groups consider which tunes will play best to the audience. And now, special effects are added when possible, whether confetti, streamers or the like. Dr. Robert D. “Bob” Hunter (’52) laughed when he said Sing Song has come a long way since that first show he directed in 1957. “My, oh my,” he said. The junior class in 2012. 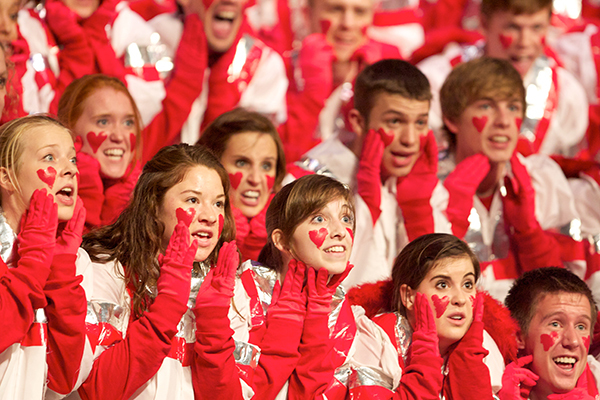 The sophomore class in 2011 portrayed Cupids on the Sing Song stage. Junior class Cupids in 2011. Where are the stories and pictures from the 90s? The senior class of ’98 made a clean sweep in 1998 – winning freshman, sophomore, junior, and senior years. Unfortunately, this post doesn’t actually say anything at all about the 90s (though it does quote an ’87 grad). The class of 1998 had a clean sweep, too, with the same director, Matt Moreland. Our senior year he was SA president! Sorry to comment on old post, but I would *love* to see video of that 1998 act. They were Roman soldiers, I think? Just an amazing act, from what I remember.